Which among us has not lusted after a pin-up? No, not the pneumatic, diaphanously outfitted bombshells painted on the nose cones of American war-birds – like the Memphis Belle – at a time when the Yanks were “overpaid, oversexed and over here”, but a pin-up gun; every bit as beautiful and, for most of us, just as out of reach. So what are the double-barrelled Dita Von Teeses? I put this question to the sporting world’s connoisseurs of curves, asking them to nominate favourite femmes fatales. Since pin-ups started in the States I thought it appropriate to begin with a cousin from across the Pond, Shooting Sportsman’s senior editor Vic Venters. Like yearning,”I’ll never know” is a major component of the pin-up gun fantasy. Most of us can only wish rather than afford. You have to be well heeled to meet the expense of the barely clothed; thus the longing for the pin-up. The rich, on the other hand, can indulge themselves and must, inevitably, be disappointed. To endure as a “romantic ideal” an obscure object of desire must remain beyond one’s reach. Here is Patrick Willoughby-McCabe’s paean to a pin-up. 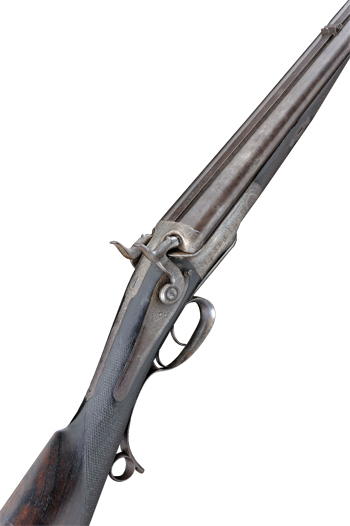 “The ultimate gun for me is a Horsley 2410 patent bar-in-wood and fore-end in wood, featuring the patent slide to the rear top lever. Almost every single one is a wonderfully built, balanced and handling gun. 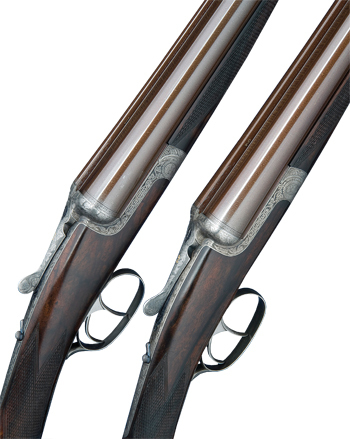 The all-wood action guns have the look and feel of a muzzle loader with the ease of cartridges. And the locks! Slim and rolled at the bottom just slightly, to go more in line with the wood encasing the action around the bottom of the frame; swept back and racy, looking like the cars that Britain would build with such style later on. The lines of the locks and barrels seem to blend perfectly with the stock. And oh, if the gun has the automatic retracting covers, indicating whether it has been fired? Just so absolutely British. Joe Hall, a man who has matched more pairs than eHarmony.com, chose the celebrated, curvaceous Holland & Holland “Royal Deluxe”, a 1913 example of which recently passed through his hands. A 12-bore dating from the golden Edwardian age, Joe’s Gibson Girl had “stunning, superbly executed engraving of mythical beasts, possibly by Harry Kell”. Hand-detachable locks “featured dragons while the underside was similarly engraved with the addition of the words ‘Royal hammerless ejector’, the trigger guard with the face of a mythical beast and the fences with two griffins and oak leaves”. Adrian Weller, a gun dealer who was once Sotheby’s expert in charge, spoke of his preferred saucy little cutie. “My all-time favourite gun was a miniature .360 hammergun built by Purdeys. I have always dreamt of owning this gun. When I was a child, it would have been great for ratting with my terrier in the ad-jacent farmer’s barn. It is probably the rarest Purdey that I have ever handled or sold – a .360 hammergun by James Purdey and Sons built in 1899 as a present from Athol Purdey to Edward Duke of York (then aged five), later to be King Edward VIII. figured stock, an overall length of 30in and weighing only 3lb 4oz. The miniature island back locks, rounded frame and top lever all engraved to scale with fine bouquets and scrolls. All contained in its oak-and-leather case with a crowned “E” on the lid. 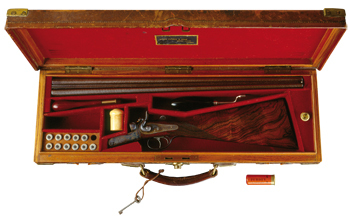 The gun was delivered on 21 December, 1899 and Purdeys still retain the thank-you letter dated 24 December from Edward, sent from York Cottage, Sandringham. “I can lust after most things, to be honest, when they are found in the right condition,” says auctioneer Gavin Gardiner. “Now what do I most admire? Probably the Boss over-and-under but I would be biased seeing as I have worked there. Well, when I was first asked to contribute to this piece, I thought ‘That’s a pretty cool idea… guns as pin-ups, easy.’ The trouble was, as with any good pin-ups, I could think of a whole wallful, and narrowing it down to just one favourite, well that’s pretty tough. Marilyn Monroe or Ava Gardner, Boss over-and-under or Purdey hammer ejector? You see, the choice is not as easy as you think. And being in the auction business for 25 years means that I have handled pretty much every exciting and exotic gun that there has ever been. Choosing a favourite is a tough call. The side-by-side-by-side triple-barrel, single-trigger Boss (think about it… three barrels, one trigger) is one that has eluded me but that is not surprising as only two were ever made. Now that would be as exciting as a triple-breasted Jayne Mansfield! Hemingway, Blixen have always got the pulse racing, but none more so than the Purdey .450 hammer rifle that was owned and used by King Edward VII (as Prince of Wales) dur-ing his month of tiger-hunting in India in 1876 and the rifle with which the future King shot his first elephant. 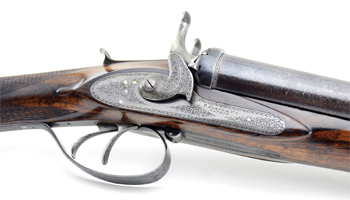 Auctioneering colleague Nick Holt nominated “a pair of James MacNaughton 28-bore top-lever, skeletal-bodied Edinburgh guns”. 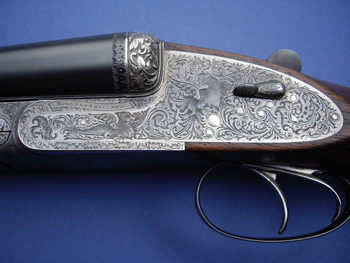 As elegant and trim as supermodels, his lissome lovelies would feature single triggers and semi-pistol stocks. 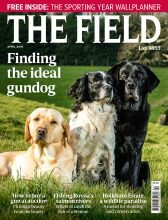 Gun dealer Jason Abbot plumped for the voluptuous curves of a pigeon gun,”a side-by-side of one form or an-other. 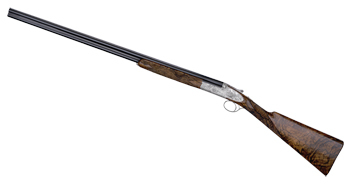 I shoot a Purdey heavy frame now, so I suppose I would covet a bar-in-wood hammer pigeon gun. I love ‘live pigeon guns’, which are always of very high quality, very strong, with heavy-framed actions, usually long barrelled, heavily choked and often with ‘trap’ stocks to shoot high. 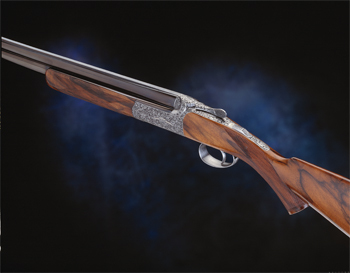 Former editor of Shooting Times and member of the Worshipful Company of Gunmakers, John Ian Gregson aspires to the modest elegance of the McKay Brown round action.  “I still remember the first time I saw a David McKay Brown gun. In my childhood den I squirrelled away a late-Seventies copy of Shooting Times & Country Magazine which carried an early ad from the gunmaker. Even as a snotty-nosed neophyte shot, I could see that the side-by-side gun I pined over in the mono image was something special. That doyen of gun writers, Gough Thomas, described the “snake-like” grace of the Scottish round action and that neatly sums up the McKay Brown, whether over-and-under or side-by-side. And my own guilty pleasure? I recently received a copy of Giancarlo & Stefano Pedretti, Master Engravers by Steve Lamboy and Elena Mitcheli-Lamboy. The book is horizontal format and, on a gatefold three pages long, lay the pin-up girl of my dreams: a Bosis “Michelangelo”. Perfectly formed and shaped like a dreamboat, the sole snag was the hyper-real game scene engraving. As titillated as I am by Italian eye-candy I want mine with an English rose (and scroll) complexion. Whatever her tint, she will remain a longing unfulfilled, for that which we admire most fervently we must admire from afar.